For the 2016-17 season, West Ham United brought out a very dark navy third kit which paid tribute to the club’s origins in Thames Ironworks. It was worn in a friendly against Juventus and the intention was that it would be used in the 2017 FA Cup but an administrative error put paid to that idea. A 5-0 home defeat to Manchester City ended their cup campaign at the first hurdle and, coincidentally, City were also involved in a previous occasion involving a little-used dark change kit. With a white away strip for 2013-14 and the home kit used against teams in red and white stripes, there probably wasn’t much need for a third shirt. Tact that the launch pictures showed the Hammers players wearing the sky blue away shorts added to the sense that this was a fashion accessory. Having reached the Capital One Cup semi-finals, West Ham were paired with Manchester City, with the first leg at the Etihad Stadium. West Ham wore their away kit as they lost 6-0 (the home leg was a 3-0 defeat) and the overall clash of white and sky blue came in for comment on social media. As luck would have it, they wouldn’t have to travel to City in the league until the final day of the season, leaving us kit-nerds waiting anxiously to see what would happen. Ultimately, it was decided to wear the third shirt, though as it was at the end of its lifespan, there was no appetite to create special shorts and socks and so the away sets were used. While they had exactly as much sky blue as they had had in January, it was easier to differentiate without the large levels of white. 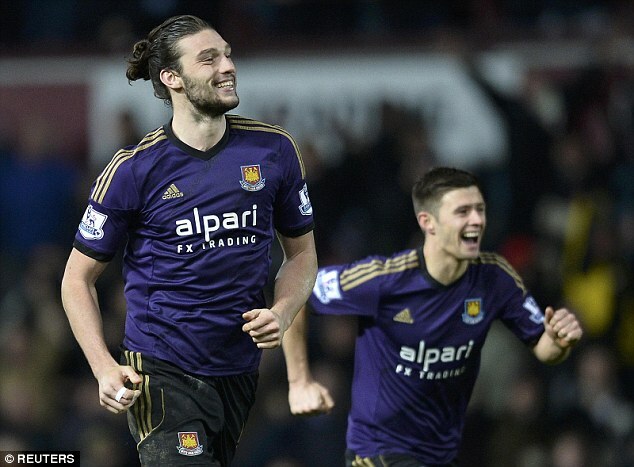 Incidentally, West Ham went with a purple third shirt in 2014-15, using it in the FA Cup.